This problem is still a problem in latest 767, but it's been happening for a number of releases now. 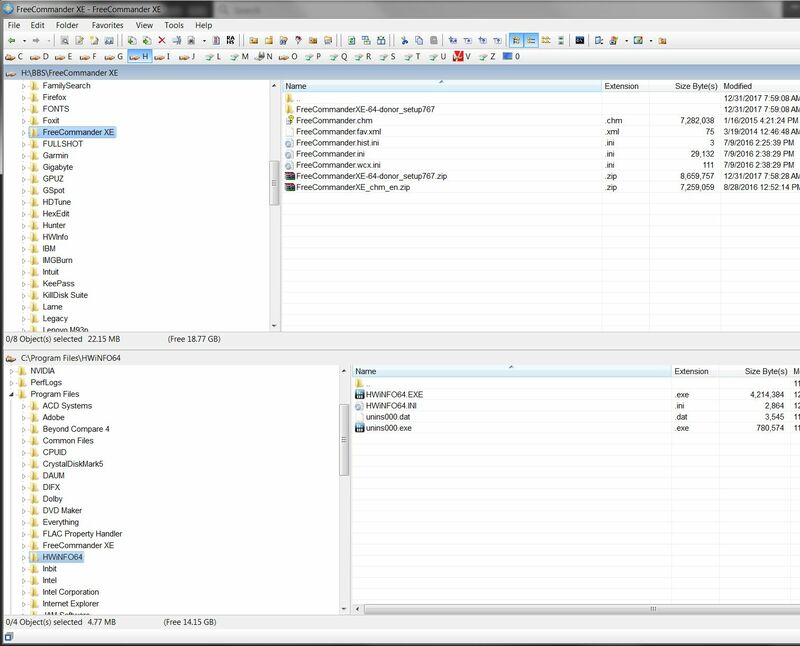 I operate in over/under split screen mode, with explorer tree on the left pane and folder contents on right pane, within each split. In other words in split screen mode I have 4 panes, and in non-split mode I have 2 panes. When I open the program having not been in split screen mode previously I get 2 panes filling the entire window. If I then push the "split" button (i.e. F10) a bright red line appears at the bottom of the window. I then drag that red line up, to split the window wherever I want, into upper/lower sections each with 2 panes. And the drive/folder presented in the lower split is the last-used drive/folder when I was in split mode. This part all works fine. However the lower-left pane (i.e. explorer tree for whatever that last referenced drive/folder is) is always TOO WIDE. There may or may not be a scroll bar at the right side of the lower-left pane depending on what drive/folder is being presented, but whether it is a scroll bar or simply a divider line between lower-left and lower-right panes it seems to always be opening at some fixed width that is not where I want it to be. No matter what drive/folder is presented in the lower-left pane, the scroll bar or divider line is always at the same unwanted too wide location. So I then drag the right edge of that lower-left pane (scroll bar or divider line) to the left, positioning it where I want. And it stays there while I remain in split screen mode, even as I change the drive/folders presented in the upper and lower splits. But if I un-split the screen (i.e. F10), and then split the screen (i.e. F10), once again that scroll bar or divider line at the right side of the lower-left pane is once again at that too-wide location. If I close the program and re-launch it (while split mode is still in effect), once again the lower two panes are not divided as I last left them. Once again the right side of the lower-left pane has moved over by itself, to that seemingly constant and too wide location. And once again I have to drag it back to the left where I want it (to be directly under the identical divider in the two panes of the upper-split). Is this a bug? Or am I failing to have some setting set correctly that is forcing this behavior? And if so, what is the setting I need to change and to what value, in order to have the width of the lower-left pane be whatever I last dragged it to, no matter what drive/folder I'm exploring in that lower split. Could you send me your freecommander.ini file? dsperber, thanks for posting this bug report. I was just about to report the exact same issue. My usage of FCXE64 is very similar to your experience. The additional twist to this bug which I noticed is this: When you are already using the split mode (whether via F10, or calling a custom layout), close split mode via F10. Then re-open it yet again with F10. Notice the tree pane which was not currently in focus before split mode was called has gotten even wider. Each successive close and re-opening of split mode with F10 moves the right border of that not-in-focus tree pane further to the right. I have yet to determine which release started to show this problem. Thanks again for posting. Sorry for this second post. I forgot to summarize the point I wished to make. Namely, this problem can impact either the upper or lower left tree pane.